Even with diligence and the highest quality products, there are still limits to what can be achieved when it comes to skincare. However, technology seems to make leaps and bounds every few months. Here is our round up of some of the best and latest technology at your disposal. Microdermabrasion and chemical peels are the two most popular treatments for brides. The reason is simple — they instantly brighten and smooth your skin, creating a smoother texture and even color tone. 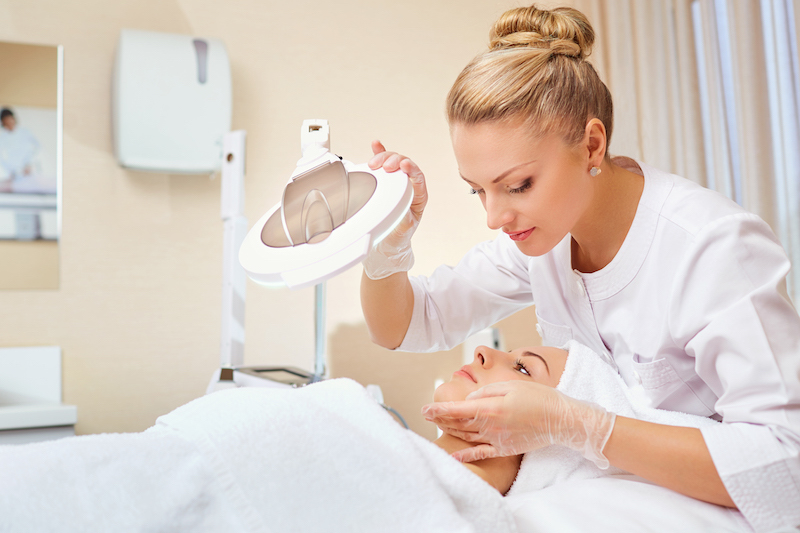 Microdermabrasion is a physical exfoliation and is often combined with dermaplaning, which removes fuzzy facial hair as well as dead skin cells. Applying a chemical peel after microdermabrasion allows the peel to infuse more effectively into the skin. Different peels address different concerns such as helping to clear acne, hyperpigmentation or fine lines. There is even a hand peel to reduce pigment and retexturize the skin and a body peel to exfoliate and hydrate. Whichever one you choose, skin appears clearer and more radiant. When topical treatments are not achieving the results you are looking for, it might be time to consider a laser, and there are many from which to choose. Fractional laser technology addresses skin texture, firmness, elasticity and pore size appearance. Intense Pulse Light lasers most commonly address skin tone, brown and red discoloration, sunspots and facial veins. One of the most popular choices for brides is the Clear + Brilliant. After less than 30 minutes, skin is brighter, clearer and more even. It is also the perfect procedure to build into the pre-wedding skincare routine as the best results are seen after a course of treatments. Lip filler injections are accomplished by injecting synthetic hyaluronic acid, a gel-like substance of cross-linked sugar molecules naturally found in our skin. It can do a variety of things when used in the lips: plump, hydrate, or improve symmetry. Best of all, it is instant and immediately gratifying. Dr. Deirdre Hooper of Audubon Dermatology tells us about her approach, “I use Volbella, a filler, it is an absolutely beautiful way to subtly define and enhance the lips. The cannula technique I like minimizes the needle sticks and it only takes 5 to 10 minutes. The effects are immediate and last a year. CoolSculpting is a fat-freezing procedure first approved by the FDA in 2010. It is now the No. 1 non-invasive fat reduction method in the world with over 4 million procedures a year. Rounded paddles suction skin like a vacuum and cooling panels crystallize fat cells to cause “cell death,” eliminating the fat cells for good. Hooper recommends that patients have a consultation six to nine months before their wedding so they can plan out the optimal number of treatments. Hooper often combines CoolSculpting with skin tightening procedures like Exilis to further perfect the results. ThermiSmooth Body is a cellulite busting procedure offered at Khoobehi & Associates. Using an external applicator to apply radio frequency to the skin, it heats the skin to an ideal temperature to stimulate collagen and elastin. This causes the skin to tighten, creating a smoother, firmer look. Often used to rejuvenate skin under the eyes, around the mouth, forehead, eyelids and neck, it can also be used on legs and thighs to reduce the dimply look of cellulite. If you are considering a procedure, take photos of your trouble spot from different angles and discuss it with well-researched dermatologists and plastic surgeons.